Ah, world, what lessons you prepare for us, even in the leafless winter. It was probably overdue. It’s late autumn after all. But the cold front still caught me by surprise. Strong winds slammed into the house in the small hours, pulling me out of a deep sleep as something loose crashed around outside. 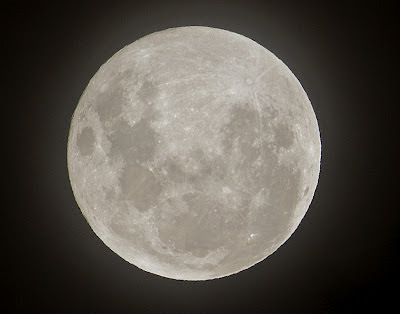 All week the night sky had been unusually bright, a full-to-waning moon orbiting as close as it would for some time. But when I peered outside to check the damage the sky was dark, the moon smothered in thick wet cloud. It was pouring, and I guessed – or hoped – that any harm was minor. I stumbled back to bed. Thankfully the morning revealed no damage to the house. Further afield bright-rimmed clouds, tall and fat, were still busy hurling snow at Kunanyi/Mt Wellington and its lower slopes. There was no disguising it, even if it was just a notice of intentions, winter was back in the neighbourhood. For much of human history, at least in cool and temperate places, winter has been the time of disease and death. It’s been the season during which the old and the vulnerable have been picked off. I suppose the common fear of winter – I feel it sometimes myself – derives from a deep-seated race memory that stretches back into pre-history. But far from reaching for the mukluks and mufflers, we Tasmanians just add another layer of clothing, preferably one that can be easily removed when the warm returns. It’s not as though we’re going to be laid up by snow for days or weeks at a time. And sure enough, two days after that cold front, the mountain’s snow has melted, and daytime temperatures are back to the high teens (Celsius). We wonder, not for the first time, whether winter is just crying wolf again. Far more predictable than snow and cold, and almost as feared, is our loss of sunshine. Summer sunsets flood my writing loft with light and heat – sometimes too much so. But now, as autumn resolves into winter, the sun has retreated, setting in the north-west. And it’s many hours earlier than in summer, sending only pale and slanted light into my west-facing window. Most days I don’t even get home in daylight. So I choose to make the most of daylight hours by walking in our bush of a morning. There, in these last few weeks, I have been comforted by the oddly-timed blooming of one of our more humble native plants, the sunshine wattle. 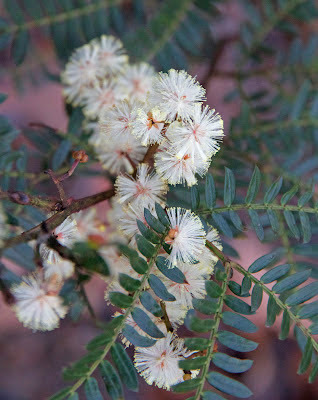 Its botanical name is Acacia terminalis, although it once bore the species name discolor. 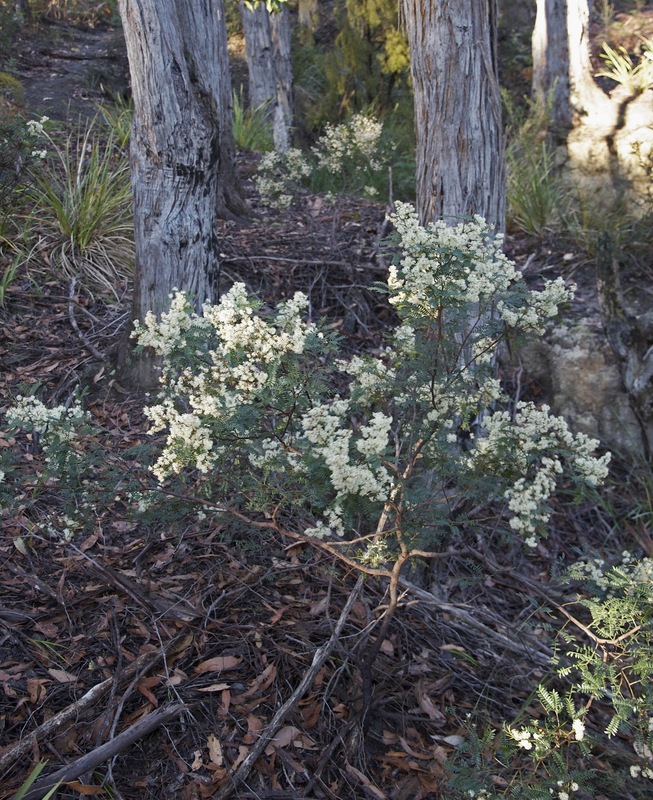 That earlier Latin name means “wattle of a different colour”, as it is so much paler and less conspicuous than our more famous golden wattles. It is also a great deal smaller than most, being lucky if it reaches 3m in height, at least in our bush. One grey, wet morning I am drawn over to a stand of these wattles. Their profuse, pale blooms are set off by the tree’s dark foliage. True to their name they seem to shine in the gloom, smiling in the face of coming winter. I find my own mood lightening just by being among them. 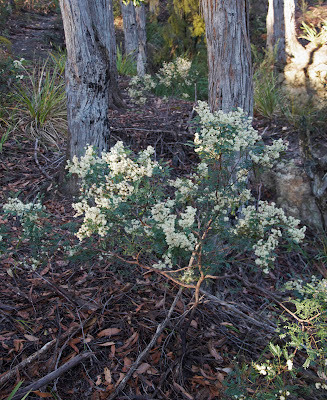 I discover later that the distilled essence of sunshine wattle is alleged to have similar effects when used in aromatherapy. One company extols its ability to promote optimism in those who have had a difficulty or are stuck in the past. I’m rather sceptical about aromatherapy. I also resist spending money on that which is basically free. So as winter deepens, if I find myself in need of a shot of optimism, I think I know just where to find it.